We describe a rare case of lethal multiple pterygium syndrome which was diagnosed prospectively at 16 weeks of gestation in a fetus without a family history of the disorder. Diagnosis was based on antenatal sonographic demonstration of severe limb contractures, absence of fetal limb movements, and a large cystic hygroma. The prevalence of multiple pterygium syndrome is unknown. This condition is inherited as an autosomal recessive pattern and some cases are also inherited in a X-linked recessive manner. The mutation in “cholinergic receptor, nicotinic, gamma” (CHRNG ) located on 2q37.1 is responsible for development of this syndrome. The mutation in the CHRNG gene results in a defective or missing γ subunit of the Acetyl Choline Receptor (AChR) and severity of the this gene mutation influences the severity of the condition. Lethal type results when there is no production of any γ subunit , while mutations that allow the production of some γ subunit will lead to the Escobar type of multiple pterygium syndrome. In the absence of this functional γ subunit, the fetal AChR protein is not assembled properly in the muscle cell membrane and the communication between nerve cells and muscle cells in the developing fetus is impaired. This results in a fetal akinesia sequence which leads to early embryonic immobility due to which the skin grows over the underlying joints, leading to formation of multiple pterygium. A 28 year old woman, 5th gravida with previous four first trimester abortions presented to the antenatal outpatient department at 6 weeks of gestation for antenatal registration. She had history of consanguineous marriage. Her previous pregnancies were missed abortions at around 2 months of gestation, for which suction evacuation was done. She was being evaluated by a private practitioner for bad obstetric history. Her parental karyotyping was normal. Thrombophilia profile with protein C, protein S, Anti thrombin III, Factor V Leiden mutation had already been done prior to this conception and found to be within normal limits. She was negative for Anti nuclear antibody, double stranded DNA, Lupus anticoagulant and Antiphospholipid antibody. TORCH titres were done which ruled out active infection. Her Thyroid stimulating hormone and glycosylated haemoglobin were in normal limits. Her blood group was Rh positive. She was started on periconceptional folic acid. In this present pregnancy she had spotting per vaginum at 6 weeks of gestation. On speculum examination there was minimal bleeding and on vaginum examination uterus was anteverted, 6 weeks, bilateral fornices were free and non tender and external os was closed. She was admitted as a case of threatened abortion with bad obstetric history. There was no further episode of spotting and ultrasonography confirmed a single live intrauterine gestation with gestational sac diameter of 24.4 mm, corresponding to gestational age of 6.4 weeks. She was started on low dose aspirin and micronised progesterone. 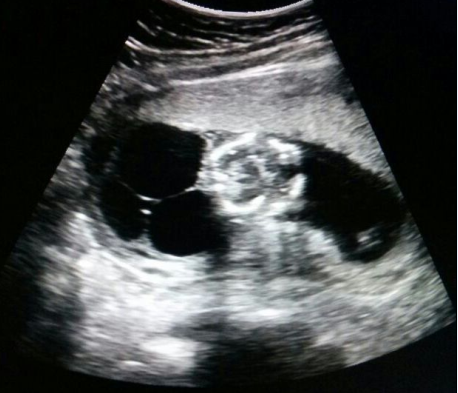 Her first trimester screening scan was done at 12 weeks of gestation which showed a cystic lesion in the posterior part of the neck with septations suggestive of cystic hygroma and was advised chorionic villous sampling to rule out aneuploidies. A detailed malformation scan was done at 16 weeks of gestation which showed multiple malformations in the baby like cystic hygroma of 4×5 cm, body wall oedema, scalp oedema, pericardial effusion with all four limbs fixed in one position with no movement of the limbs. 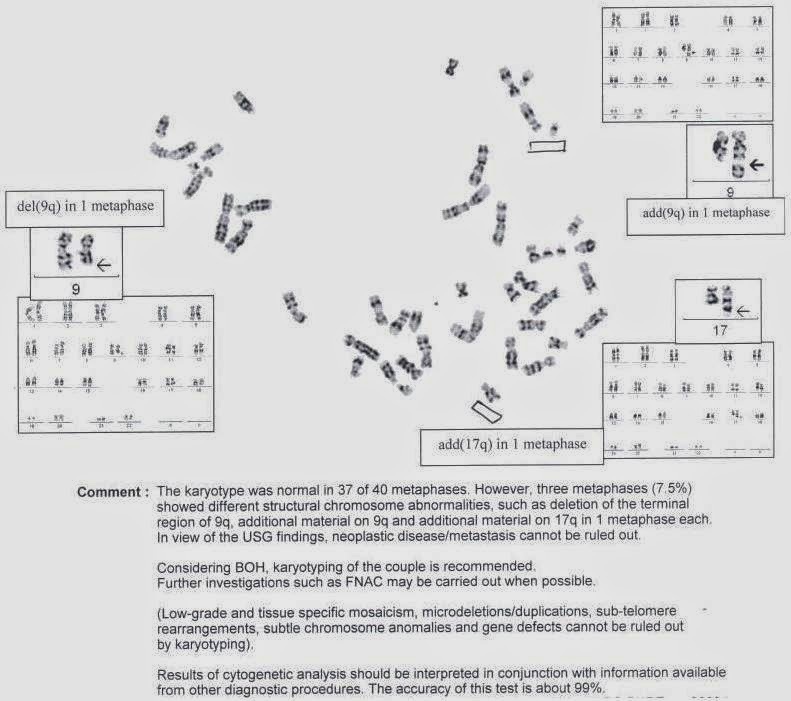 Chorionic villus sampling report was suggestive of normal karyotype in 37 of the 40 metaphases but three metaphases (7.5%) showed structural chromosomal anomalies like deletion of the terminal region of 9q, additional material on 9q and additional material on 17q in 1 metaphase each. On the basis of these findings, the patient and her relatives were explained about the poor fetal prognosis and they opted for termination of pregnancy. A second trimester medical termination pregnancy was done with misoprostol.. The weight of the abortus was 240 g and morphological appearance showed multiple pterygium at the neck, elbow, fingers, knee with cystic hygroma, malformed ribs, and atypical facial features which clinched the diagnosis of lethal type of multiple pterygium syndrome. Figure 1. Ultrasonography showing fixed lower limbs at the knee joint with no fetal movements. Figure 2. Chromosomal analysis report of chorionic villi. Figure 3. 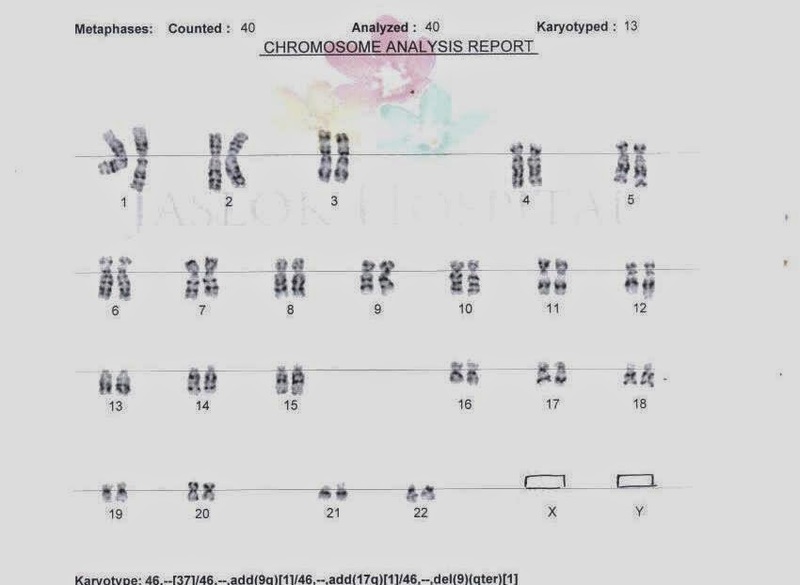 Chromosomal analysis report of chorionic villi. Figure 4. A and B: Anterior view of fetus having multiple pterygium at the neck, elbow, wrist, knee and ankle, syndactyly of the fingers, orofacial anomalies and rib defects; C: Lateral view. Note low set ears, rib defects and a appendage at the sacral region. Multiple pterygium syndrome is a condition that can be diagnosed in the antenatal period and is classified into two types; Escobar (nonlethal) and Lethal types. They are differentiated by the severity of their symptoms. Escobar type is the milder variety and Lethal type is fatal before birth or very soon after birth. The majority of fetuses with the Lethal disorder die in utero, and the those few who survive pregnancy develop pulmonary hypoplasia in the early neonatal period. In multiple pterygium syndrome of the Escobar type, there is webbing typically affecting the skin of the neck, fingers, forearms, inner thighs, and backs of the knee .They may also have short stature, lung hypoplasia, arthrogryposis, scoliosis, orofacial features including ptosis, downslanting palpebral fissures, hypertelorism, long philtrum , small mouth, epicanthal fold, micrognathia, cleft palate, cleft lip and low-set ears. Musculoskeletal abnormalities include multiple flexion contractures, rib anomalies, vertebral anomalies like scoliosis, lordosis, congenital hip dislocation, soft tissue syndactly of the fingers, rocker bottom feet and talipes equinus. Males with this condition can have cryptorchidism and females can have absent labia majora. Escobar type does not deteriorate after birth as γ subunit found in the fetal AChR protein is replaced by another subunit to form adult AChR protein at thirty-third week of pregnancy and this is the reason most people with this type do not have problems with muscle movement after birth and later in life. includes Pena-Shokeir syndrome, congenital myotonic dystrophy, arthrogryposis multiplex congenita and nonlethal pterygium syndrome. 2. Morgan, N. V., Brueton, L. A., Cox, P., Greally, M. T., Tolmie, J., Pasha, S., Aligianis, I. A., van Bokhoven, H., Marton, T., Al-Gazali, L., Morton, J. E. V., Oley, C., Johnson, C. A., Trembath, R. C., Brunner, H. G., Maher, E. R. Mutations in the embryonal subunit of the acetylcholine receptor (CHRNG) cause lethal and Escobar variants of multiple pterygium syndrome. Am. J. Hum. Genet. 79: 390-395, 2006. 3. Hoffmann, K., Muller, J. S., Stricker, S., Megarbane, A., Rajab, A., Lindner, T. H., Cohen, M., Chouery, E., Adaimy, L., Ghanem, I., Delague, V., Boltshauser, E., Talim, B., Horvath, R., Robinson, P. N., Lochmuller, H., Hubner, C., Mundlos, S. Escobar syndrome is a prenatal myasthenia caused by disruption of the acetylcholine receptor fetal gamma subunit. Am. J. Hum. Genet. 79: 303-312, 2006. 4. Martin NJ, Hill JB, Cooper DH, et al: Lethal multiple pterygium syndrome: Three consecutive cases in one family. Am J Med Genet 24:295, 1986.